Go to original pattern for design DROPS 91-17. 100-150-150-150-200 gr nr 13, beige. DROPS 5.5 mm [US 9] needles, or size needed to obtain correct gauge. 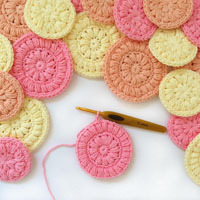 Gauge: 1 repeat in width and 21 rows in height in Pattern 1 = approx. 8.5 x 10 cm. 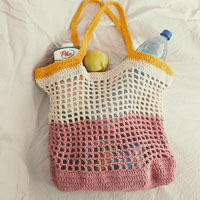 Stockinette st: 15 sts x 21 rows = 10 x 10 cm. Pattern: See the charts. The pattern is seen from the right side. There are two charts for Pattern 2 – use the appropriate chart for your size. 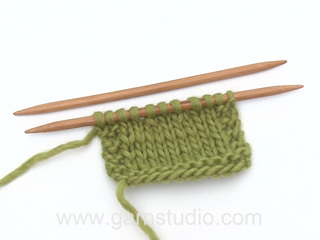 After 3 edge sts: slip 1 st as if to knit, K 1, psso. Before 3 edge sts: K 2 tog. Front: Loosely cast on 58-64-72-78-84 sts with 2 strands Silke-Tweed. Knit 2 rows garter st (row 1 = right side). Change to 1 strand Silke-Tweed + 1 strand Vivaldi and establish pattern on the next row as follows (right side): K 1 (edge st knit in garter st), 0-3-0-3-6 sts in stockinette st, Pattern 1 over the following 56-56-70-70-70 sts, 0-3-0-3-6 sts in stockinette st, and K 1 (edge st knit in garter st). Continue in pattern as established. When the piece measures 10 cm inc 1 st at each side every 4 cm a total of 6 times = 70-76-84-90-96 sts – inc inside 1 edge st at each side by pulling up a st from previous row and knit in stockinette st. For Size XXL after 1 inc at each side you can knit ½ repeat of Pattern 1 at each side inside of edge sts, the sts increased later knit in stockinette st. When the piece measures 35-36-37-38-39 cm bind off for armhole at each side every other row: 3 sts 1 time, 2 sts 0-1-1-2-3 times and 1 st 1-2-1-2-3 times = 62-62-72-72-72 sts. Continue the pattern with 1 edge st in garter st and 2-2-0-0-0 sts in stockinette st at each side. 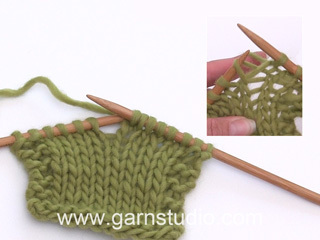 When the piece measures 42-44-45-47-48 cm (measure from bottom points), knit and bind off for the neck following Pattern 2 (use chart for your size) – the remaining sts knit the same as before. After neck shaping is complete 22 sts remain on each shoulder. Continue the pattern, keeping 3 sts in garter st at the neck edge (and 1 edge st in garter st + 2-2-0-0-0 sts in stockinette st at armhole as before). When the piece measures 54-56-58-60-62 cm dec 2 sts evenly distributed (do not dec over the sts in garter st). On the next row bind off all sts. Back: Cast on and knit the same as the front. 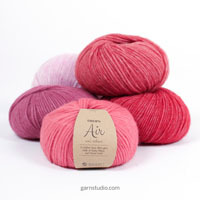 Bind off for armholes as on front and continue until piece measures 52-54-56-58-60 cm. Now dec 2-2-6-6-6 sts evenly distributed over the center 18-18-28-28-28 sts = 60-60-66-66-66 sts. 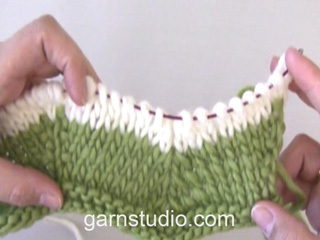 Then knit 4 rows with garter st over the center 22-22-28-28-28 sts. On the next row bind off the center 16-16-22-22-22 sts for the neck = 22 sts remain on each shoulder. Continue the pattern, keeping 3 sts in garter st at the neck edge (and 1 edge st in garter st + 2-2-0-0-0 sts in stockinette st at armhole as before). Sleeve: Loosely cast on 34-36-38-40-42 sts with 2 strands Silke-Tweed. Knit 2 rows garter st (row 1 = right side). Change to 1 strand Silke-Tweed + 1 strand Vivaldi and establish pattern on the next row as follows (right side): K 1 (edge st knit in garter st), 9-10-11-12-13 sts stockinette st, Pattern 1 one time (= 14 sts), 9-10-11-12-13 sts stockinette st and K 1 (edge st knit in garter st). Continue the pattern as established. When the piece measures 12 cm inc 1 st at each side every 4-3.5-3.5-3-3 cm a total of 9-10-10-11-12 times = 52-56-58-62-66 sts – inc inside 1 edge st at each side by pulling up a st from previous row and knit in stockinette st. When the piece measures 49-48-48-47-47 cm bind off for sleeve cap at each side every other row: 3 sts 1 time, 2 sts 2-3-3-3-3 times and 1 st 1-1-1-1-2 times. Continue to bind off 2 sts at each side until piece measures 55-55-55-55-56 cm, and then bind off 3 sts at each side 1 time. Bind off the remaining sts, the piece measures approx. 56-56-56-56-57 cm. Assembly: Sew shoulder seams. 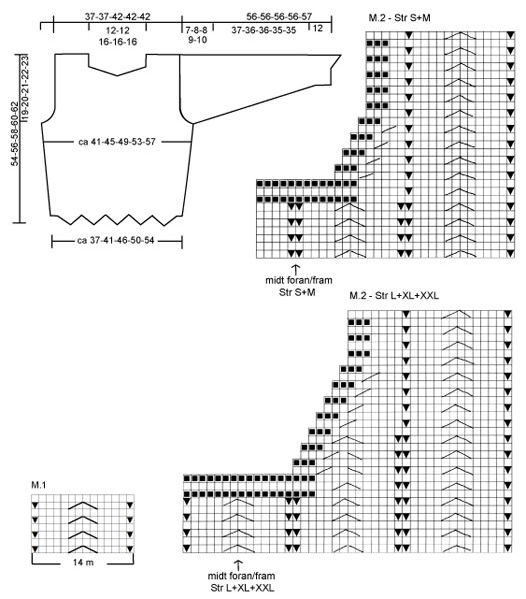 Sew in sleeves using edge sts as seam allowance. Sew sleeve and side seams using edge sts as a seam allowance. 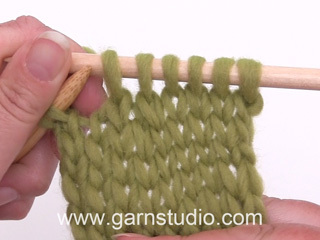 Gauge: 16 sts x 34 rows in garter st = 10 x 10 cm. Scarf: Cast on 29 sts around 2 needles with 1 strand Vivaldi (so that the edge will be elastic). Pull out one needle and knit garter st. When the piece measures 80 cm (measure when piece is lying flat) bind off all sts – so that the bound-off edge will be elastic, make and bind off a yo every approx. 5 sts).